Wizards of Oz: [Moblog] Best BBQ! Duke's in downtown Wytheville (extreme southwestern Virginia, about 60 miles from Bristol) is hands down the best BBQ in the southeast! It even bests my old fave' Pierce's Pitt near Colonial Williamsburg. Duke's is closed on Sundays, but open 10-8 every other day ('til 9 on Fri. & Sat.). I don't know what kind of drugs you are on! Either that, or you are ignorant of what real barbeque is. Duke's doesn't even smoke their products, their ribs are boiled then sauced and grilled... this is not barbeque. 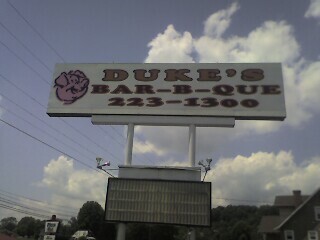 Best barbeque in the Southeast! That is laughable, considering that real barbeque is big stuff in NC, SC and nearly all states in the Southeast.